The New York Jets are sticking with Todd Bowles. The roster he coaches next season might look a lot different. Bowles is 15-17 in his two-year tenure with New York, which hired him in January 2015 after firing Rex Ryan. He had been the subject of increased criticism by some fans and media in recent weeks because of a few ugly losses and questions about his in-game management and handling of the locker room. But the Jets (5-11) announced after the game that owner Woody Johnson decided that Bowles and general manager Mike Maccagnan will return next season. "One of the biggest things with the NFL and something that's very helpful to franchises is continuity," said quarterback Ryan Fitzpatrick, who threw two touchdown passes in what was likely his final game for the Jets. Fitzpatrick went 20 of 30 for 210 yards, but is likely to be among the big names to go because he's a free agent and unlikely to return. It could have also been the final game with New York for cornerback Darrelle Revis (who had his first interception of the season in the game); wide receiver Brandon Marshall (inactive because of a hip injury); and center Nick Mangold (on injured reserve), among others. The Bills (7-9) also face some uncertainty this offseason after firing coach Rex Ryan earlier in the week and elevating offensive coordinator Anthony Lynn to the interim role. Two people with direct knowledge of the situation told the AP before the game that Lynn is the clear favorite to take over the job permanently. One person called Lynn's succession to replace Ryan as being "the working plan." Another person said the final decision on general manager Doug Whaley's recommendation rests solely with owners Terry and Kim Pegula. Both people spoke to the AP on the condition of anonymity because the Bills have not revealed details of their coaching search. "Until they tell me I'm not employed anymore," Lynn said, "then I have to go back and get these evaluations done and look at our team and what we have to go after in the offseason." A third person with direct knowledge of the discussions told the AP that former Jacksonville coach Gus Bradley is a candidate to become the Bills defensive coordinator under Lynn. Bradley was fired by the Jaguars two weeks ago. Lynn was asked if the Bills, who have missed the playoffs 17 straight seasons, have indicated to him that the job is his. "No," he said. "Not at all." Safety Corey Graham called the pending decision "very important." "We're all very interested to see what's going to happen, whether it's a new guy coming in or if it's going to be A-Lynn," he said. "It's going to affect me, if I have to learn a new defense." 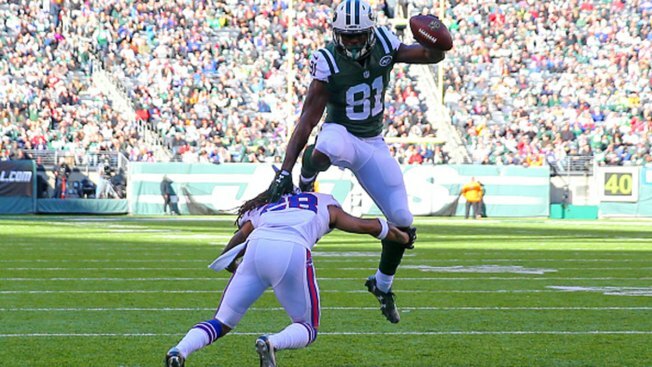 The Jets took a 7-0 lead on a 2-yard pass from Fitzpatrick to Bilal Powell, who also finished with 122 yards on 22 carries. Dan Carpenter's 34-yard field goal made it 7-3, but the Bills missed out on more points when EJ Manuel underthrew a wide-open Charles Clay. Nick Folk kicked a 30-yarder as time expired in the first half to give the Jets a 10-3 lead. The Jets got a turnover on the Bills' next drive when Corey Lemonier - claimed off waivers during the week - got a strip-sack of Manuel and Jordan Jenkins recovered at the Buffalo 13. Officials initially ruled Manuel down, but Bowles challenged the call and it was reversed by video review. Three plays later, Jalin Marshall reached over the goal line for a 6-yard touchdown reception that made it 17-3. Buffalo turned it over again on its next possession, Sheldon Richardson recovering a fumble by Jonathan Williams. New York's Doug Middleton recovered a kickoff in the end zone after the Bills' Mike Gillislee allowed the ball to bounce, giving New York a 30-3 lead. Gillislee tried to make up for the gaffe with a 1-yard TD run with 39 seconds left to cap the scoring. Manuel started at quarterback instead of Tyrod Taylor, who was inactive for the game with a groin injury. Manuel made his first start since Oct. 25, 2015, and finished 9 of 20 for 86 yards. He was replaced by Cardale Jones in the fourth quarter, and the rookie was 6 of 11 for 96 yards with an interception. Buffalo running back LeSean McCoy limped to the sideline with a high right ankle injury after a 2-yard loss on the first play of the second quarter. He was carted to the locker room. X-rays were negative, he was upgraded to a "probable" return, though he didn't get another carry. Bills wide receiver Sammy Watkins also left late with a hip injury. Bills running back Reggie Bush finished the season with 12 carries for minus-3 yards, becoming the first NFL running back to have negative yards rushing with 10 or more carries. He had no carries against the Jets.